OneTaq DNA Polymerase is an optimized blend of Taq and Deep Vent® DNA polymerases for use with routine and difficult PCR experiments. OneTaq® Quick-Load® 2X Master Mix with Standard Buffer is an optimized, ready-to-use blend of Taq and Deep VentR ™ DNA Polymerases ideally suited to routine PCR applications from a variety of templates, including pure DNA solutions, bacterial colonies and cDNA products. The 3′→5′ exonuclease activity of Deep Vent DNA Polymerase increases the fidelity and robust amplification of Taq DNA Polymerase (1). The convenient quick-load master mix formulation contains dNTPs, MgCl2, buffer components and stabilizers as well as two commonly used tracking dyes for DNA gels. On a 1% agarose gel in 1X TBE, Xylene Cyanol FF migrates at ~4 kb and Tartrazine migrates at ~10 bp. Both dyes are present in concentrations that do not mask comigrating DNA bands. 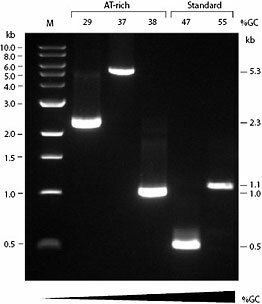 Amplification of a selection of sequences with varying GC content from human and C. elegans genomic DNA using OneTaq DNA Polymerase. Amplicon sizes are indicated next to gel, and GC content is indicated above gel. Marker M is the 1 kb DNA Ladder (NEB #N3232 ). Product specifications for individual components in the OneTaq Quick-Load 2X Master Mix with Standard Buffer are available separately. OneTaq Quick-Load 2X Master Mix with Standard Buffer is stable for fifteen freeze-thaw cycles when stored at -20°C. OneTaq Quick-Load 2X Master Mix with Standard Buffer is also stable for one month at 4°C, so for frequent use, an aliquot may be kept at 4°C. Barnes, W.M. (1994). Proc. Natl. Acad. Sci. USA. 91, 2216-2220. How should I set up a PCR using the OneTaq® Quick-Load® Master Mixes? Can I use my regular Taq-based cycling conditions for OneTaq® DNA Polymerase based products? Can I use OneTaq® DNA Polymerase in "hot start" PCR to help with specificity or primer dimer problems? What are the stability and storage requirements of the Quick-Load® OneTaq® Master Mixes? Can OneTaq® DNA Polymerase be used in colony PCR? What type of DNA ends result from a primer extension reaction or a PCR using OneTaq® DNA Polymerase? How long a product can be made by OneTaq® DNA Polymerase? Can OneTaq® DNA Polymerase be used with uracil-containing primers or bisulfite-treated DNA? What is the fidelity of OneTaq® DNA Polymerase? How should I determine an appropriate annealing temperature for my reaction? How is OneTaq DNA Polymerase different from LongAmp™ Taq DNA Polymerase? A master mix with a gel loading dye is the ultimate time-saver! It allows for easy reaction set up and with the gel loading dye already in the mix, the results of your PCR are available even faster.